Yellow Rockets Beside the Road . . . The Brassicaceae, the mustards, are certainly one of the most successful immigrant wildflower families to have arrived and settled in the Americas. My study of these herbaceous plants has allowed me to more fully comprehend the point of Jesus Christ’s parable – the mustard seed equals ubiquity. The first species I noticed residing in the West Village was Shepherd’s Purse with its gracefully-postured racemes and distinctive heart-shaped seed pods. The flowers of the biennial Garlic Mustard caught my attention for the first time last season. Most recently, as early as February, I found Hairy Bittercress, which turns out to be one of the first wildflowers to bloom in springtime New York. The weather this spring season has been a bit out of sorts. April’s dry warm days have been replaced by May’s cool showers. This flip-flop of the traditional weather pattern has resulted in lush conditions. Some mornings, when I look out into the courtyard garden, the scene full of roses, azaleas, and hydrangeas fits the look of, if not the accepted definition of, a temperate rain forest. The showy racemes of this pretty plant are what give its presence away. The funny thing is I had seen it, a lot of it, before; I just didn’t know it. During trout season drives to and from fishing destinations, I had noticed numerous patches of yellow color along the roadsides. What I was seeing was not so much individual blooms like dandelions, daises, or thistles, but something akin to a golden mist or haze just above the grassline. I didn’t have an opportunity to stop for a close look, so I stored away my observations for future reference. And then, this week, during a rare sunny day, I approached on foot the parklet located at the end of Jane and Horatio Streets on the western edge of Manhattan. What I saw, in scattered places, was similar to the yellow clouds I had seen along the roads in rural Pennsylvania and New York state. Compact rounded clusters that resembled a burst of fireworks frozen in mid-air. When I began my quest for a positive identification, I held that image in mind, which made me smile doubly wide when amongst my references I stumbled upon Winter Cress; its colloquial name is Yellow Rocket. Rooted to the ground, Winter Cress has pinnately-divided, deeply-lobed basal leaves that if picked before the plant blooms make a reasonable, seasonable green. The stems are glabrous and support thin silique like other members of its species. 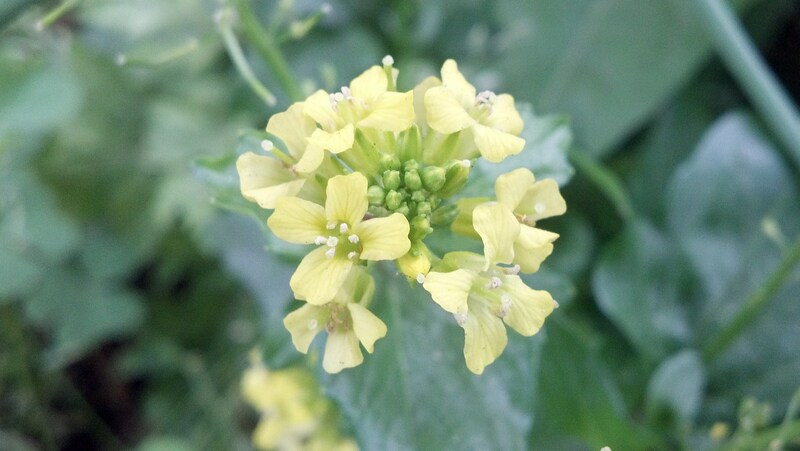 Unlike the other Eurasian mustards I have found growing in the West Village, Winter Cress does not bloom white. 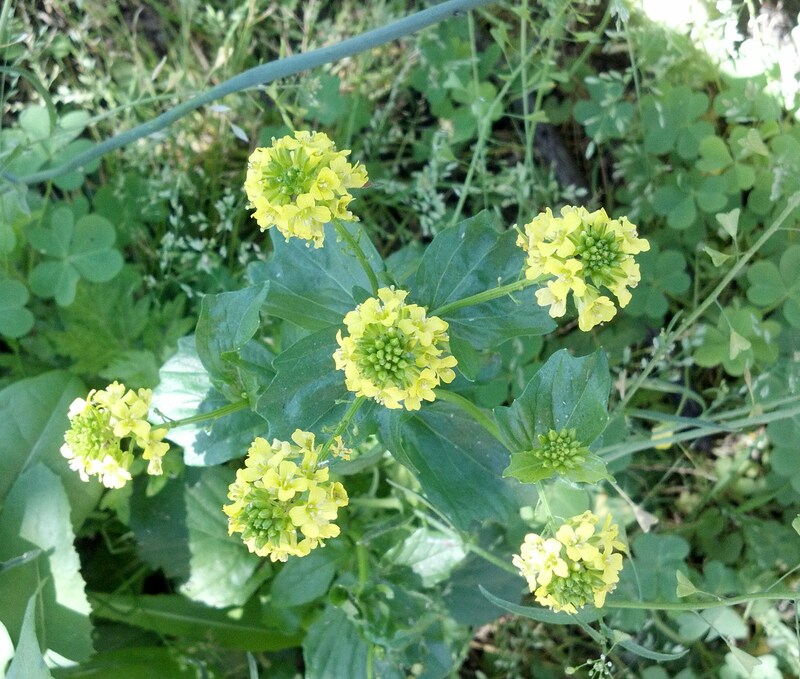 The individual flowers are tiny, have four deep yellow petals, which are clustered in a half dozen or so terminal racemes that are tighter and rounder than other mustards, giving this biennial a bushier profile that conveys the shape of fireworks descending to earth. Hudson River Park has begun a summer Hudson River Park WILD! nature walk series, Sunday mornings meeting at 9:00 am at Pier 40. I’d love for you to be able to join in sometime and share your wildflower expertise. This Sunday, June 10, the walk is led by Walter H. Laufer, and the following week by myself, Keith Michael. We continue to alternate through the summer. The walks draw attention to the teaming natural life in the park – mostly between Pier 40 and Chelsea Piers – birds, butterflies, insects, wildflowers, etc. Even if the Sunday mornings don’t work out for you, I’d be very interested in meeting you sometime.